Contracts are one of the most basic legal structures that make it possible for people to form dependable business relationships, conduct business transactions and obtain reliable property rights. When they are well crafted they create a solid agreement and process for the parties which leads to a successful outcome. When they are boilerplate download forms or previous contracts which have been edited by the parties they become the source of a high volume of litigation forcing a judge or independent arbiter to determine the intent of the parties and the genuine “benefit of the bargain” each expected. At the Watkins Firm, we carefully craft and negotiate effective contracts which are designed to support our client’s goals and objectives. When a dispute arises, we vigorously protect our client’s rights in contract litigation. To schedule a free, no-obligation consultation, contact us today or call us at our offices in San Diego at 858-535-1511. When you are entering into a contract, it is important to be sure that it accomplishes your goals to the greatest extent possible. This not only means tough negotiations with the other party. It means carefully crafting an agreement that can be legally enforced if necessary and does not threaten you with excess liability. We are familiar with the applicable provisions of California contract law, as well as federal laws that can have an impact on contractual relationships. We are experienced at drafting many different types of contracts, including those involving goods, services, shipping and real estate. 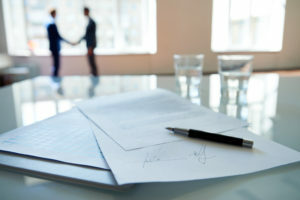 The interpretation of contracts is one of the most commonly disputed legal issues. 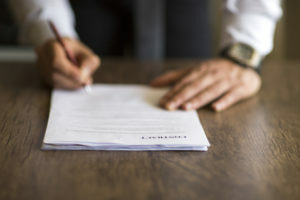 If you have a contract dispute with another business or individual, it is important to consult a lawyer who is prepared to seek a positive result in litigation (or, if required by the contract, alternative dispute resolution). Our attorneys are experienced at enforcing contracts and defending against contract suits. Because we also draft and negotiate contracts, we have a great deal of insight in this area. Don’t hesitate to contact us to discuss how our experienced trial lawyers can assist you at protecting your rights and privileges under California contract law.